On the 28th February we will be exhibiting at the 2018 International Confex show at Olympia in London. The event is set to be full of lots of different and exciting opportunities for all types of businesses involved in the events industry and a great chance for us here at MODEX to show off our products and services. Here at MODEX, we have streamlined each step in the exhibiting process to make sure the whole procedure is as simple, hassle-free and effective for all participants involved. 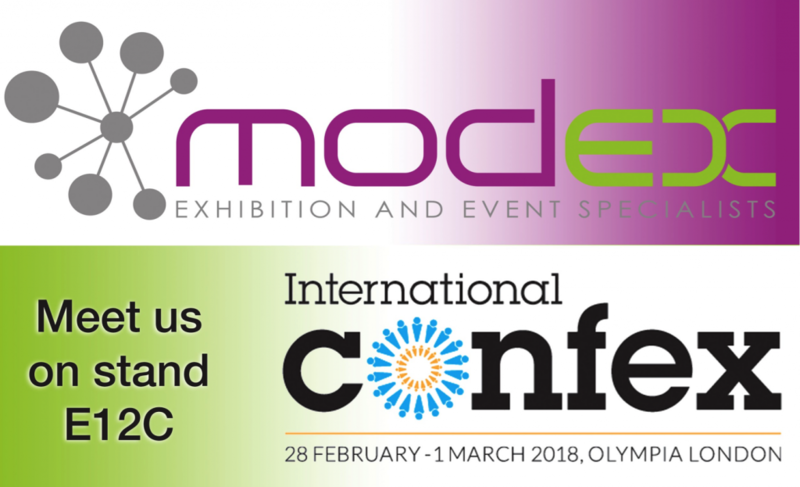 Discussing everything from enhancing a show floor’s atmosphere to integrating state-of-the-art technologies into an exhibition stand, our team will be there to tell you all about the extensive range of benefits MODEX has to offer for both working with organisers and exhibitors. We will be engaging with a range of organisers and end users to ensure that we stay up to date with the latest industry trends, that our stands are successful and act as significant marketing tools for any company looking to grow their business. Martin, Rob and Chris will be at the show to answer all of your questions and to tell you about our exhibition stands and the MODEX way of doing things. So, if you want to know a little bit more about our service, company or team and how we can help your business, come visit us on stand E12C – we look forward to meeting with you. To keep up with all of the latest MODEX news follow us on Twitter feed.